This year is the fourth year that I was blessed to witness Navaratri celebration here in our Centres of South Africa. Two years back, Mother made me visit all our branches in Northern Natal about which you might have read in this blog here. I have no hesitation to say that of all the functions observed here at our Ashrams, doubtless Navaratri (Durga Puja in Ramakrishna tradition parlance) holds a special charm. At no other time one can witness such a display of devotional faith and fervour as at this time. Besides Headquarters, the Sub-centres at Chatsworth and Pietermaritzburg in Southern Natal, had clay images of Mother Durga. Sri Sarada Devi Ashram at Asherville had also such a murti. All these four murtis are designed to be of ashtabhuja (eight-armed) and simha-vahini (riding the lion). There is no ubiquitous demon King Mahishaasur! 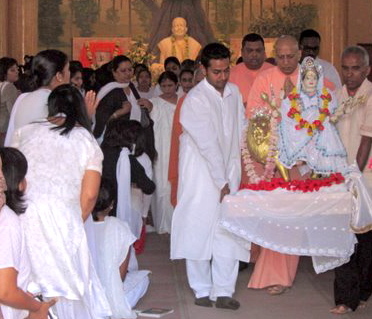 Recently I heard from brother Swami Saradaprabhanandaji that his Guru and the Second president of the Ramakrishna Centre of SA, Swami Shivapadanandaji wanted to popularise the benign form of Mother Durga among the devotees. Each day these murtis were lovingly decorated and dressed, and freshly garlanded. Since every cluster of three nights of the nine-night festival are dedicated to Mothers Mahakali, Mahalakshmi and Mahasaraswati each, representing the three gunas of prakriti viz., tamas, rajas and sattwa, Mother was appropriately adorned with garments in blue-black, blood-red and milk-white colours. And there She was, in all her divine glory and splendour, silently accepting the adoration of Her devotees, through their soulful songs, the hearty recital of hymns, divinely discourses and purifying pujas. People ask me often, ‘Swamiji! from where do you get such beautiful murtis? Are they imported from india?’ Well, the murtis are ‘proudly South African!’ diligently made by a lady-devotee, who is a dedicated worshipper of the Holy Trio, very much a citizen of SA. She considers the preparation of the Durga murti as an act of her special sadhanaa. After making prayers to Master, Mother and Swamiji, she first casts the Foot of the Mother. She confided in me that bowing to the Foot represents the crushing of her ego – the ego that thinks she is the creator of the Image. She would pray with humility, that Mother might bestow Her grace upon the artist. The lady acknowledged that the artist in her was merely an instrument of Mother, performing the act of Mother’s Will. On Mahashtami day, after Master’s puja at the Temple, we gathered at the Nischalananda Hall where Sri Durga Havan was performed to the chanting of entire Devi Mahatmyam and oblation offered at the end of each mantra followed by recitation of the mantra with vilva leaf oblation– ‘Aum Aim Hreem Kleem Chaamundaayai Vicce’. This was too joined by all the assembled devotees. Long before the 700th ‘svaahaa!’ was chanted in chorus, the minds of the devotees had already begun to soar to great spiritual heights. The Master stroked Mathur’s chest and said: Oh, is this what makes you afraid? Who has told you that you will have to live without the Mother? And where will She go even if you immerse Her image in the Ganges? Can the Mother stay away from Her son? For the last three days She has accepted your worship in the worship hall, but from today She will accept your worship constantly, sitting in your heart”. And Mathur was mollified. The tradition of Navaratri here among the Hindus is a mixture of North-South combination. The days were spent in a blissful mood for which I am grateful to our Sri Thakur, Ma and Swamiji although my tour for 14 days from 1st to 14th october was extensive and hectic. And this feeling of joy is nonetheless due to the gracious blessings of all senior monks and loving vibrations from younger brothers. And finally is the devotional feeling with which devotees like you who are house-holders, always wish for the welfare of the monks! Previous Post: Why Ganesha ‘Lord of Obstacles’? Please accept our prostrations at your Holy Feet. Navaratri was indeed a very auspicious time for all of us. Your article is very informative and re-affirms one’s belief in the Mother. In our branch too we, devotees had arranged satsangs on all days. We all remember your inspiring Talk on the devotional scripture “Devi Mahatmyam”. May Mother Durga be our guiding light! By the grace of Thakur, this body-mind complex is well. Yes! we all felt the Divine Grace of Mother shining ever so brightly during the auspicious week of Navaratri. May you always accord our Divine Mother with your heart’s devotion, then you will be assured of Her everflowing Grace. I pray by the grace of divine Mother you are well. I am extremely grateful to you for showing me the way on how to approach and derive maximum benefit from these festivals for our spiritual growth and development. As many of our scriptures and Master too say: ‘in this age the way is to cultivate deep devotion to the divine’. This year, Maharaj! I spent navarathri at Veerabhoga, and I can say that it was spiritually a rewarding experience. If our approach is sincere then wherever one may be, the grace of the Mother will descend upon us. I really missed you and your divine wisdom, Maharaj and look forward to catching up from this week’s satsang. 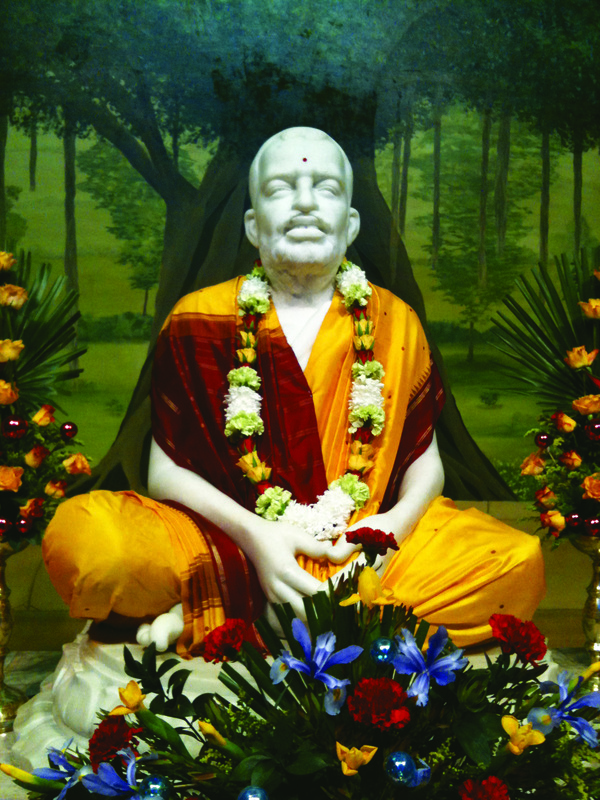 The universal Teachings of Sri Ramakrishna make His message easy to understand, so that it is useful to all who are wending their way Godward. One salient purpose of the Master was to teach mankind to love and worship God as Mother. Wherever and whenever a devotee chooses to call on God, answer is sure to come! Your spending the entire Navaratri period at the holy feet of Lord Vishnu and in that process gaining ‘spiritually a rewarding experience’ has made me very happy. You are always welcome to the Saturday satsangs! You have once again captured the feelings of euphoria of the devotees during Durga Pooja so eloquently in the most apt words. Yes, it was a sad day when we had to consign “Mother to the Ocean”, but we have taken refuge in what Master had said that Mother will always be with us in our hearts and in everything that we do. A number of Holy Mother’s sayings express Her faith in Advaita Vedanta: “In the course of time God and other things disappear. After the attainment of knowledge one realizes that the Master and other forms of God are maya. They come and go.” May your devotion to Mother be on the increase, May She who is Sarada jnaana-daayikaa award you with jnanam and bhakti. It fills our heart with a heavenly joy when we come to know about how devotees there worshipped the Mother with utmost devotion and simplicity of heart. My pranam to the devotee who is blessed by the Mother Herself for giving her the ability to prepare Her image. The very method of her making the image depicts how pure in heart she is. In this eternal paradise created by the advent of the Holy Trio, we devotees can bask in the sublime solace. It is really the greatest possible fortune one can ever have in this human life. Everything depends upon Her grace. To obtain that Grace, work must be performed through self effort, sincerity and devotion. The wonderful Grace of the Mother enables the devotee to make the murtis. Ultimately it is faith that imparts stability and confidence to a devotee. May the divinity within you shine forth like a blazing flame. It is very nice to see a report on Durban Durga Puja in your blog. Here also we have celebrated navarathri by keeping golu in our house. Daily I used to chant Lalitha Sahasranamam and mahishasura mardini slokams. In the evenings, our Bengali and Tamil friends visited and we gave as prasad chundal and vettalai pakku-manjal with fruits and coconut. Sriram-Juma’s baby Puja is keeping us very busy. Golu is of course unknown in this country. So far I haven’t heard about it from any Tamil-speaking people. Chanting of Lalitha sahasranamam and other hymns indeed make us pure and increase our devotion. I shall duly inform you when my going to India is planned. No idea as on now! I have never missed a Navaratri satsang. However, for many years i was not able to witness the immersion ceremony. By the Holy Trio’s grace, this year was my first. The satsangs at the ashram during the 9 nights simply increased our awareness that Mother is in and around us. The climate and every little detail on Sunday was perfect and left us all on a spiritual high. Maharaj’s discourses, as always, left food for thought and also greater understanding of the celebration. I am extremely happy that you enjoyed your first Immersion Ceremony! The weather was perfect and it was such a joy to see so many devotees assembled to bid farewell to Mother. I hope that this is only a glimpse of a much more higher, spiritual life waiting for you. May you secure intense love of God is my fervent prayer. Humble greetings on the auspicious occasion! I had long been waiting for the divinely inspired post on this grand occasion and am glad that it is finally here. It is deeply inspiring to read about the artist devotee! I always feel that artists are a vibhuti (glory) of the Lord. And we know, the sculptor of the Divine Image of Mother Kali at Dakshineshwar would meditate for hours before he started working. This is a luminous example for all artists. It is a treat to see the joy of the devotees during the worship. Being down with viral fever and cold, I could not attend any of the ashrama programmes nor do anything special which left me sad till I saw a portion of the live broadcast from Belur Math on DD Bangla! That was gladdening indeed! This is such a grand time of the year with festivals galore. And even imbibing the atmosphere makes for a lively particiaption! 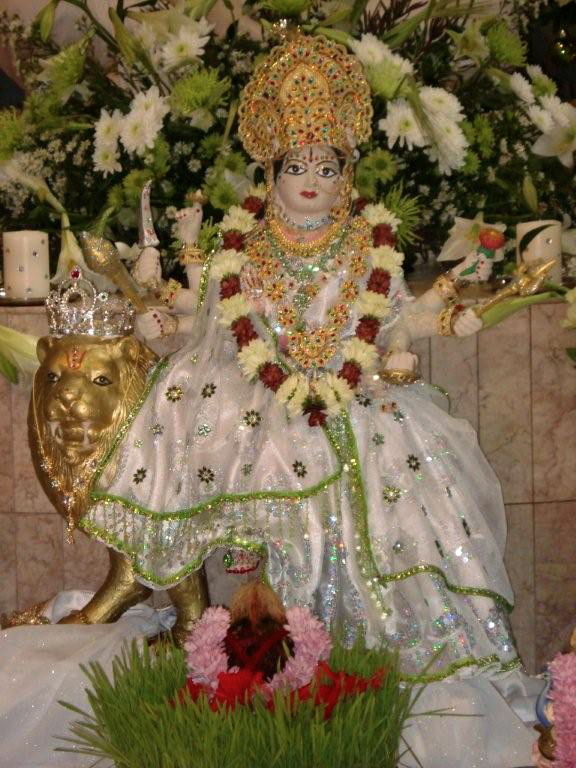 Looking forward to more on this beautiful blog Revered Maharaj! I trust that you have recovered from the viral flu by now. Don’t be saddened that you could not visit the ashrama during this auspicious Navaratri time. With your thoughts immersed on the Divine Mother, you were very near to Her rather than those who were there but kept their mind elsewhere! That is great indeed. Bhakti to the Lord reigns supreme. Keep the mind concentrated on God, which will automatically result in communion with Him. I am very much feeling as if you have forgotten me!!! SWAMI MOHE NAA VISAARIO, LAKH LOG MIL JAAYE! HAMSE TUMKO BAHUT HAI, TUMSAA HAMKO NAAYE!! Never for a moment think that I have forgotten you. You, along with many other devotees that live far off from me are in my constant prayer. I often think of the good works that you along with some Sadhus performing at the “All boys school” at the Sakwar Village. How did you like my doha? Are you satisfied now? Even though I know that I am unworthy of it, there has to be some personal benefit I can take from being named after an ansh of the Lord! Brother Churiwala is indeed blessed to be in Maharaj’s thoughts and prayers. I have heard from a mahatma that there is no greater blessing in spiritual life than finding a corner in the heart/mind of a sant. Yes, what you learnt from that mahatma is very true. Is that not the very reason that the devotee-poet doesn’t want wealth and property, neither silver nor gold but wants only a small corner in the heart of the Divine mother? Please accept my loving pranam! Revered Maharaji’s explanation on the Divine Mother’s mantra – “Om Aim Hreem Kleem Chaamunadaayai Vicche” shed a new light on my understanding of this auspicious mantra. I now find myself repeating devotedly the mantra every so often during the day and night. I was wondering whether it is possible for Maharaji to please explain the meaning of the mantra on the blog, (time permitting) so that the readers can also benefit. As always my most reverential and loving pranam! Yes, indeed it will be beneficial to all readers if only some one can transcribe the entire Talk that went for 75 minutes! Since thats quite difficult, I am thinking of placing the Talks in the internet so that people can just listen to or can download it and listen later as per their convenience. It was so refreshing to read the new post. We had a beautiful Navarathri celebration here in Pmb. It was such a joy to recite chapter 5 of the Devi Mahatmyam on a daily basis. Revered Swamijee’s discourse was enlightening as usual. A few of us recorded the Talk. I often listen to this discourse and other discourses that Maharaj had delivered while working in my office and happy to say that my whole day is stress free! Yes, I heard from many devotees of Pmb that Navaratri there was indeed a spiritually elevating function. I was present one of the nights. Do you remember that this wonderful Devi Scripture called Devi Mahatmyam contains Four Hymns in Cha 1, Cha 4. Cha 5 and Cha 11? Chanting of Aparajita stuti as it is called in Cha 5, is wonderful and Devi graciously bestows all that devotees need. May Master’s grace be ever with you!